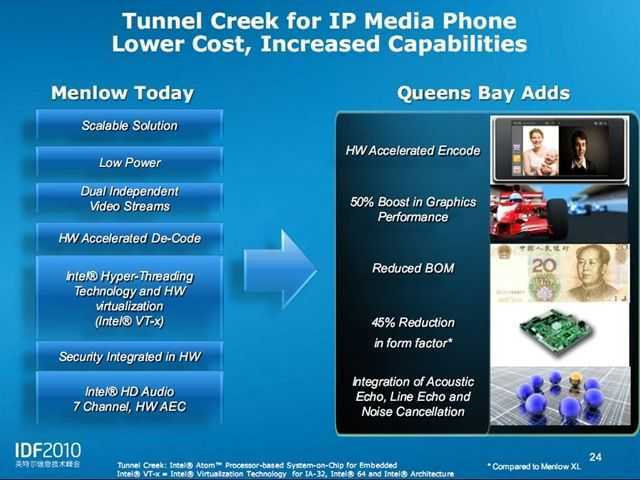 A few days ago I did some research and analysis on the new ‘Queensbay’ platform from Intel It’s a highly integrated 2-chip system comprising Tunnel Creek processing platform and I/O chip that takes the platform used on many current MIDs and UMPCs and optimizes it in a similar way that Pinetrail did for netbooks. Despite some improvements in size and graphics power and a hint that it might be capable of some cool consumer and media devices, it’s not the Apple A4 / Tegra 2 competitor that I’m guessing will get referenced in articles today. That job lies with Moorestown and I’ll tell you more about that later today on Carrypad. Update: Intel Moorestown article now available. Tunnel Creek was formerly announced today. See Intel Press Release. More detailed information has already been made available. See below. I’ll write about Moorestown later today but for the time being, here are some schematics for Tunnel Creek; the first showing the differences between Menlow (I’m using a PC based on Menlow right now) and Tunnel Creek and the last slide showing Tunnel Creek vs Menlow in a mediaphone scenario. There are a couple of things there that I didn’t mention in my previous article. Number 1 â€“ hardware accelerated video ENCODE. 2) Audio DSP functions. This leads me to believe that Tunnel Creek is in fact a version of Lincroft, the processing unit used in the Moorestown platform. We’ll talk more about that later. For a primer on Moorestown, see the links below. More detailed information on Moorestown architecture is expected from IDF later today. Moorestown â€“ Digging a little deeper. 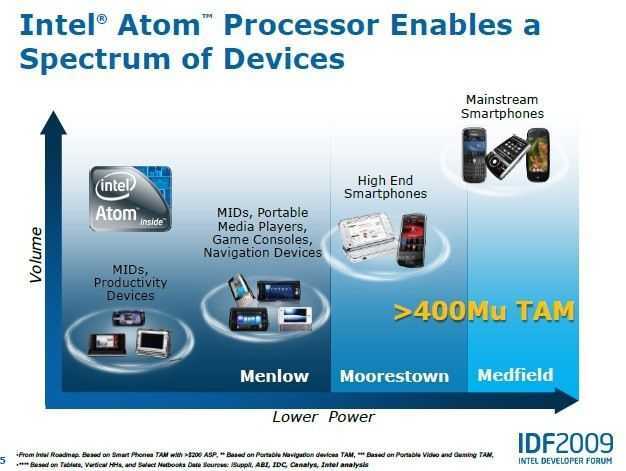 Intel’s Moorestown Platform. From Smartphone Through Smartbook and Beyond. ARM Products for MIDs in 2010. The starting point for a mobile internet device design is to look at the processing platforms available in the market. I’ve spent the last few days researching and reviewing the ARM-based CPUs and platforms and put together a full report that you can find over at UMPCPortal. If you’re tracking news about MID and ‘smart devices’ from CES next week, keep this as a reference. 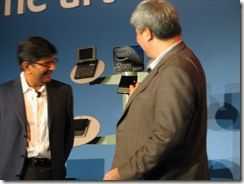 ARM Products and Platforms Primer and Resource List for Mobile Internet Devices in 2010. 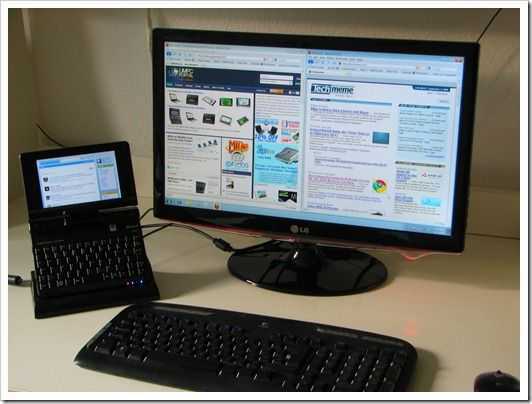 | UMPCPortal – Ultra Mobile Personal Computing. Moorestown and Pinetrail graphics core thoughts. GMA500 likely. 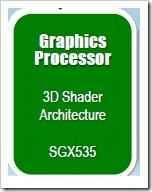 During a session at IDF this week though, I had fairly concrete confirmation from people in-the-know that the graphics on the Moorestown platform would be a GMA500 (PowerVR SGX core) as you’ll find in the Menlow (Poulsbo chipset as seen on the Asus T91, Viliv X70 and other mobile and long battery-life-focused solutions.) I was a little surprised that it’s the GMA500 but have no reason to disbelieve the info I was given. Dovetailing nicely with that information though is continuing speculation that Pineview, the CPU+GPU on the Pinetrail netbook platform is also going to use the GMA500. The original info comes from a June article by HKEPC but LinuxDevices seem fairly confident that it is in fact a GMA500 core in Pinetrail. Its looking like we’re going to have a very closely-matched range of platforms come mid-2010 then. Sodaville â€“ Atom CPU + PowerVR SGX core. Note: In each case the graphics may be clocked at different speeds ranging from 133 â€“ 400Mhz. On current devices we see a 133Mhz graphics clock. The exciting thing about this is that everything is aligned well to keep it simple for developers and there’s just one operating system that will sit on top of all these to provide optimised kernel, drivers, SDK and app-store. Moblin. 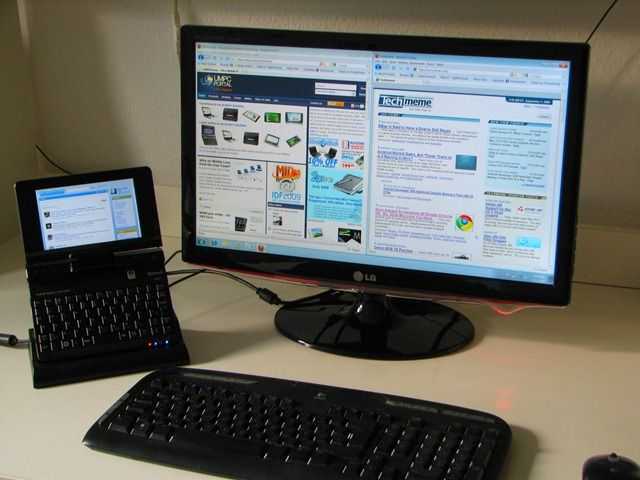 From smartphones to netbooks through set-top boxes, PNDs, PMPs, Web tablets and more. One platform for developers that covers, in the 2010-2012 timeframe, an addressable market of over 400 million units, in just the mobile internet device and smartphone segment. Add a few hundred million on top of that for netbooks! Intel’s ‘Continuum’ is starting to come together. 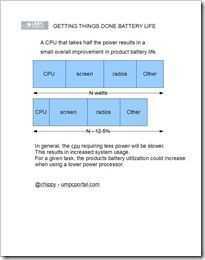 Improve your UMPC performance….for free. I’m sitting here in front of a huge 1920×1080 screen with a 1280×800 screen as an extended display. Windows 7 is running and I’ve got 10 Firefox tabs open, Windows Media player, Tweetdeck, Windows Live Photo Gallery, Windows Live Mesh, Windows Paint and Windows Live Writer running. (Love those Windows Live apps!) It’s all running smoothly on the tiny Fujitsu Loox U (U820/U2010) in 1GB RAM. The last time I was able to do this was with the 1.8Ghz version of the OQO 2+ but it wasn’t as smooth as this. Why? The last point is something I’ve talked about before but can now highlight in a very very simple way. With 10 tabs running on Firefox, the chances are that you’re using a few heavy ajax or flash-based sites. 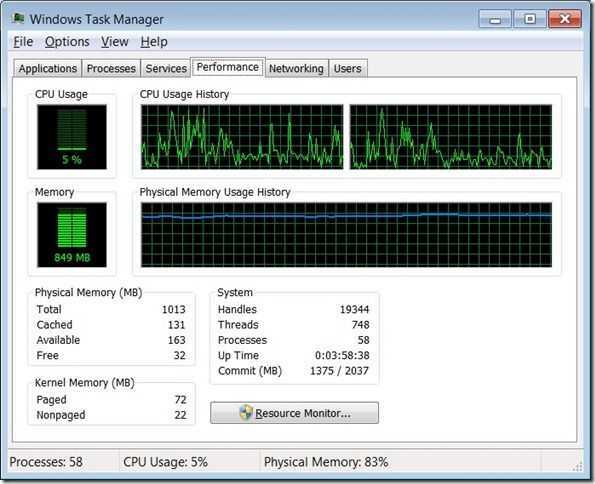 It should be no secret that web browsing is one of the most CPU intensive tasks you can do on a device and even if you’ve got windows minimised, it’s still using the CPU in the background. I’ve used Noscript in the past to optimise my browsing experience and there are other, more scientific tests that highlight the advantages but today, because of the dual screen setup I have here, the effect is extremely pronounced.These two CPU graphs taken over about 2 minutes of browsing, show the difference. Before. Browsing websites. Hitting CPU limits. You can see the typical heartbeat of a flash animation. After. Browsing websites. CPU not hitting limits. Average utilization is much much less and that heartbeat has gone. A few more processes running in this test too. 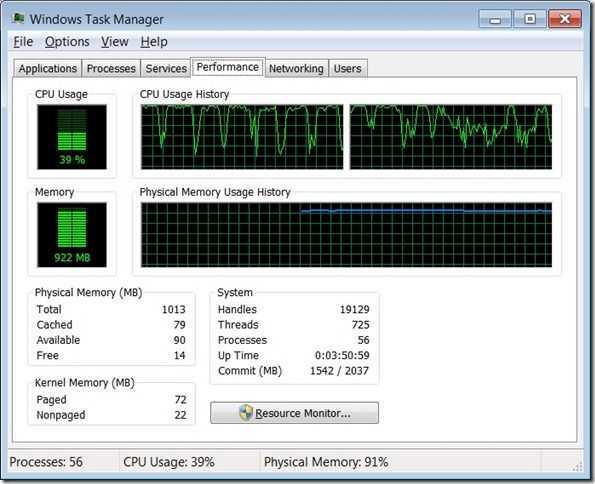 The difference is huge, very noticeable and within 2 minutes of installing NoScript, the fan turned off. It’s firing up every now and again but it’s not pegged on like it was before. As I type this I have 12 tabs open, the Firefox process is averaging 4.5%. I’ve done tests like this in the past and seen the CPU averaging 15-20%. Bloggers and advertisers will hate you for it but if you’re using a UMPC, it’s one of the best CPU/Battery life/heat/noise savers there is out there. And it’s free. There’s something else that can be learned from this. When using web-based applications, there is no such thing as a device in standby. ARM and Intel would do well to encourage desktop browser developers to enable an optional ‘pause when minimised’ feature (there’s a reason that the iPhone doesn’t multi-task) . It will have a huge effect on the mobile web experience. If it saves as much as I’ve just seen it would be more significant for the mobile web than a couple of years of technology development. I vote for Opera 11 to have this feature. Combined with ‘Turbo’ it would make Opera the best browser for mobile computers. MIDs, UMPCs, Smartbooks. Where Are We on the Timeline? We’ve been talking about the area of mobile internet-connected devices between the smartphone and notebook for a long time now. Many companies have tried with many many different designs but in reality, none of them have been a success. OQO, Flipstart, Wibrain and Raon Digital are proof that it’s a market where many are going to fail before a winner comes along but what is it going to take to make that winner and how close are we to it? Where are we on the Mobile Internet Timeline? There are three components to a successful mobile internet product. Hardware (including technology and design), software (including UI, apps and community) and the magic pixie dust that is the combination of pricing, branding, distribution and marketing needed to bring the device to the people in just the right way. Unfortunately I don’t know enough about marketing to be able to comment (apart from the fact that I think that certain marketing teams are easily capable of making it happen today) but my experiences with ultra mobile devices and customers over the last 3 years gives me some idea about what’s needed for the hardware and software components. One of the keywords that I keep coming back to in this segment is the word ‘microblogging.’ In my mind, microblogging is the word that connects to all the elements that go to make up a good mobile internet device. I’ve listed those below. Pervasive and low-cost mobile internet connectivity. I talk a bit more here about my own ideal microblogging device and the markets it addresses but let’s focus on a more generic level here. Of all the items listed above, the first two are the biggest issues. These are the ones that are limited by current technology and have prevented engineers from creating what could be the ideal device so lets take a closer look at these. Form Factor â€“ Style. Keyboard. Screen. There’s no real answer here expect to say that most styles and form-factors in most materials are possible today. A keyboard creates a thickness problem and a folding screen option would be nice for the industrial designers but I’m confident that given current industrial design knowledge, materials, skills and production technologies, almost anything is possible today. Fasion changes but given economies of scale, anything should be possible. Being always connected means not having to charge a device for a whole day of about 15 hours. This has been possible with mobile phones for along time but we’re talking about a different level of ‘always connected’ with a mobile internet device. This is not a device that will sit idle. Background software will be checking emails, waiting for instant messages, polling social networks, processing GPS signals, updating locations, checking for software updates, playing music, checking accelerometers and ambient light levels, scheduling alarms and the device will probably be in-use, with the screen backlight on, every 15 minutes during the day. Idle devices are a thing of the past and that’s where the technology challenge comes in. Running these scenarios on a phone architecture results in a dead battery within hours. I know because i’ve tested it! The answer here is not to use the lowest power CPU but to use a very closely coupled hardware and software layer that can schedule events at the right times and make sure the device sleeps for as long as possible. 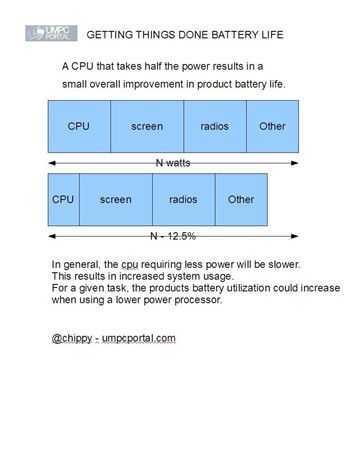 In general, low power devices take longer to perform general purpose processing tasks so the power advantages are outweighed by the need to keep screens and radios active. In general, a device that can perform tasks quicker in processing ‘windows’ and then resume to a standby state is probably going to have the advantage. [See this article for more thoughts and view the image on the left.] How far away from that are we? Quite far. We’re in a very early stage of mobile internet software development and unless a golden bullet comes along in the form of new battery technology, the problem will need to be worked on for some time before true all-day mobile internet ‘computing’ is possible. Getting a task completely quickly and efficiently means better user satisfaction and more productivity. The days of waiting 20 seconds for a web page to load on a smartphone are over and we need to be looking towards the sub 10-second page load. Ultimately, 5 seconds for every page on the internet. Not only that but applications need to start instantaneously and user interfaces need to react in a physical way in order for the device to become more a part of the user. How far away from that are we? Quite far. The new generations of smartphone are improving very well and reaching the 15 second average page load level along with having great almost instantaneous interfaces but its still the exception. UMPCs and netbooks are into the sub 10-second level for web page processing but still struggle to meet the battery life requirements when doing so. In general we need about 4x efficiency improvement from the X86 based devices and about 4 x processing power improvements in the ARM-based devices. Both sides are moving very quickly towards it but we’re a couple of years away from what I would call a thrilling experience. As for the rest of the list, we’re pretty much there now. Location, storage, video and software is available. It’s just a matter of sticking it al together in the right way and focusing on the limitations above. The dream of that ultimate mobile internet communications device is spread wide across potential consumer base and the industry itself but we’ve still got a long way to go. 2009 is an early point on the timeline where although devices are possible, customers are burdened with issues. Be it battery life or slow web processing, heavy form factors or tiny screens. The good news is that everyone working in the industry is already working on those problems and we’re now only a short few years away from seeing devices that satisfy everyone. I wake up this morning to a clearer understanding about where Moorestown fits but to an article that highlights that there’s a lot of marketing to be done by Intel. The new platform, demonstrated yesterday on a number of working devices, appears to be technically very capable and extends through a number of product sectors. It brings new levels of processing power and leads in making the Internet in your pocket more ‘real’ than with any other platform I’ve researched and yet there’s a surprising lack of interest. In fact, over the last 24 hours, there has been more interest in Intel’s deal with Wind River than with their move into the smartphone market. What happened? E3, smartbooks, booth babes, an Apple conference, Palm Pre reviews and a lot of other news have a lot to do with it so perhaps the timing wasn’t exactly perfect. Perhaps Intel could have helped too. 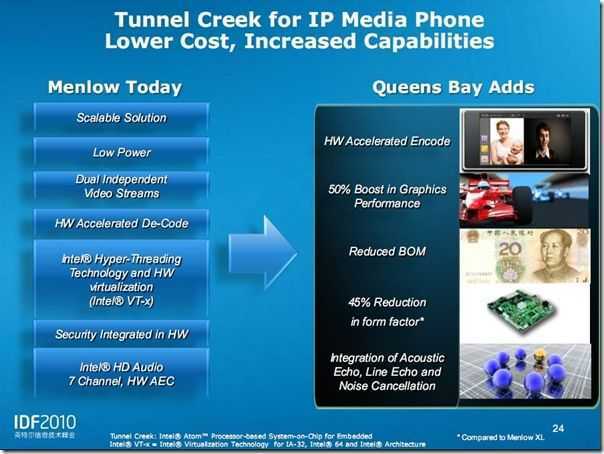 They’re calling it a MID platform and up to now, there really hasn’t been much penetration for the term and certainly no big-number consumer hit so attention levels could have been low when Intel mentioned that the platform is voice-call capable. They also failed to mention that the platform is 720p recording capable and that it could be used to make some amazing Moblin-based smartbooks. 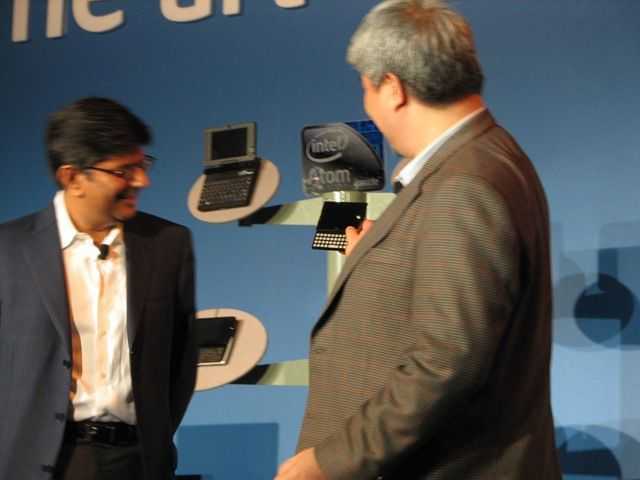 Intel is confident that they would be better than the ARM based ones too! Maybe I can help, just a little, by trying to simplify the key points. What does Moorestown mean for consumers? Expect Moorestown-based devices to be as small as a smartphone and to be able to run, on a smartphone sized battery, for over 24 hours. 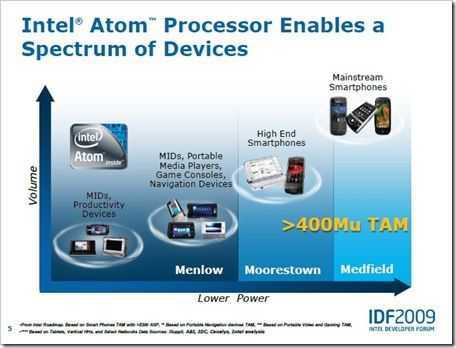 Intel are telling us that devices will idle with 50x less power drain than today’s Intel Mobile Internet Devices. The worst MID I ever tested ticked-over for about 1 hour on the juice of a smartphone-sized battery. Intel says that this will increase to 50 hours. The best-case scenario, based on testing I’ve done on the current best-of-Intel is 3-times that figure. 3-days active standby. Moorestown scales. It sleeps with one eye open but when it wakes up it’s capable of Internet browsing speeds, accuracy and richness that you will have never seen on an ARM-based device. I’m expecting high-end versions of Moorestown to bring sub 10-second average page loads to every web page on the Internet. The current best smartphones take twice as long as that and the next-gen may only shave 50% off that. I really wish Intel had highlighted HD video recording as it’s an important benchmark figure these days. Smartphone manufacturers are building these facilities into their devices and HD video is a huge growth area on the Internet. Moorestown enables 720p video recording. Not only that but the software layer has been designed with that in mind too. GPS-enabled applications with social-networking capabilities are baked into the software making it easy to make compelling mobile applications. Moblin, the name of the software that runs on Moorestown, is a standard-compliant software stack too so there’s a huge library of free software out there. Moblin has the potential to offer a very rich choice of software, for free and because it scales and can be connected to the internet all day, introduces new revenue generating models. ARM Cortex Browsing Test shows the Full Internet Experience. Here’s another one of those ‘we can beat Atom’ tests where the fine detail of the result is irrelevant. The important thing here is that, like the VIA Nano comparison test, significant, market-changing progress has been made. I’ve been talking about ARM’s Cortex A8 for a while now and keeping an eye on it in terms of its suitability for Mobile Internet Devices. Its a powerful computing core and people like Ti are using it to build very small, power-efficient media and Internet-capable platforms. Apart from Pandora, we’ve seen it being promoted for use in OHA Android phones and even for netbooks. 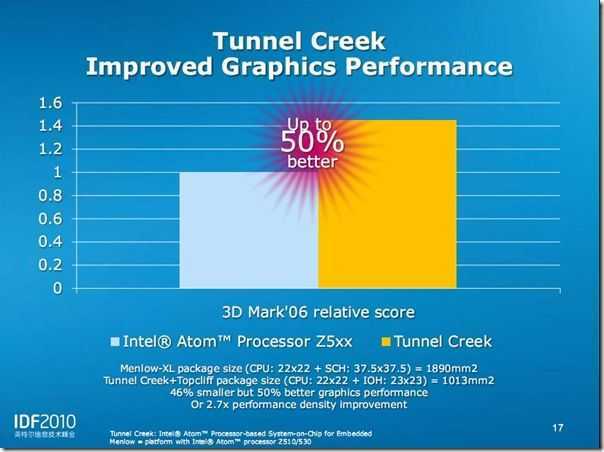 VIA Nano info and test reveals UMPC-friendly Products, Atom-like performance. Many of us have been anxiously waiting for news about the VIA Nano (formerly Isaiah) processor from VIA. Previous leaked info indicated a 2-4x improvement in processing power for a similar power drain over the older VIA C7 processors and with the Atom processors barely improving on the previous platform in terms of processing power, pro-mobile users were looking for something to fill the high-end gap. EeePCNews.de have a very interesting news article about a possible AMD CPU aimed at netbooks and UMPCs. 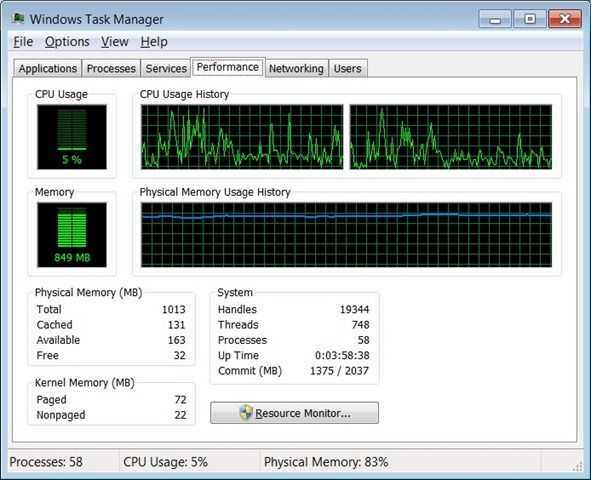 Its a 64 bit, single core CPU running at 1Ghz with a TDP of 8W. Effectively half of a Turion X2 dual-core CPU. 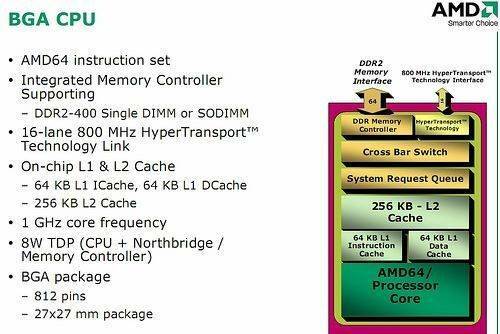 Note that the CPU includes the memory controller (Northbridge) but no Southbridge or GPU. At 8W TDP, it is an option for netbooks and possibly high-end ultra mobile PC like the AMD ultra mobile PC seen at Computex but unless an underclocked version appears at 5W or less, it’s probably not going to be cool or even small enough to squeeze inside an MID. For that job, only the Atom and ARM-based products fit the bill.